Sofas are a huge purchase, and a lot of the best materials going into them are coming from right here in the USA. Often times, large retailers will cut corners and construct their couches with cheaper materials from overseas. We did the research to find the American companies that are making the best sofas using U.S. materials in U.S. factories. Below are our findings, complete with our top recommendations and tons of details about each one, along with the factors that went into our research. Overall, there are a ton of American manufacturers making sofas right here in the U.S. – we found over 20! Most of the prominent companies are located around the North Carolina area, which has historically been a big hub for furniture manufacturing. A big theme with our top picks is the ability to sell directly from the manufacturer to the consumer – doing so cuts out the retailer and allows manufacturers to reinvest those dollars (that the retailer would have gotten) into improving the quality of their product. We’ve split out each of our top picks into different style categories: slipcovered, customized, leather, sectional, loveseat, tufted, modern, and high-end couches. Read more about each of them below. Check out additional details on each of our top picks, where they are from, what we liked about each one, and some of the things we didn’t like. Handcrafted in North Carolina, the Charleston sofa from Club Furniture is as good as it gets when it comes to affordable slipcovered sofas. You can choose from around 100 different color swatches and the slipcover is completely removable if you want to switch up your style. We also love the comfort level – this couch is very deep with soft cushions (available in 2 or 3 cushions), but not too much sag. The springs, especially in the middle of the sofa, hold up well to 3 or 4 people sitting on the couch at a time. Club Furniture has great customer service as well, with completely free in-home delivery and set up and a 30-day in-home trial. Dimensions: W93″ x D40″ x H34″. 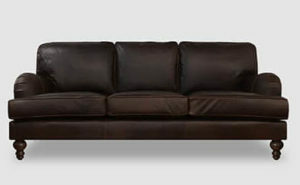 We were really impressed with a lot of the furniture options from Charlton Furniture, especially their Alverta Loveseat. This company is a family owned and operated business in central Massachusetts and has been in operation for more than 50 years. The Alverta Loveseat is made with durable hardwood frames and really high quality fabric. The 100% polyester fabric is even hand-stitched to the loveseat! There is no assembly required and it comes with a 1-year warranty. The interior is filled with Certi-PUR foam, which we found to be very comfortable and our research indicates it holds up for a very long time as well. 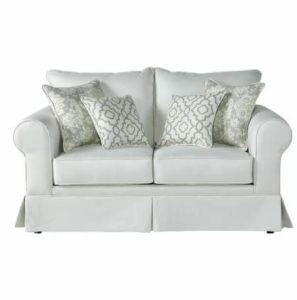 Overall, you can’t really go wrong with this classic white loveseat in your living room. Craftmaster is one of the many great American furniture manufacturers with roots in North Carolina. Based in Taylorsville, they’ve been producing quality sofas since 1972 and employ over 700 American workers in environmentally friendly facilities (they are EFEC certified). Their tufted Kailey sofa was one of our favorites for it’s unique look and tons of style options. There are about 80 different fabric colors you can choose from, along with customization options for the color of the legs and throw pillows. The upholstery is a pretty standard polyester blend, which holds up well to long-term use and abuse. The cushions are super comfy and the back of the sofa sits relatively deep, so you have plenty of room for accent pillows to give the sofa your own flare. Carolina Chair’s motto is “come straight to the source,” which is a spot-on description of this factory direct, family-owned sofa manufacturer based in Hickory, North Carolina. They have an impressive variety of fabrics and styles to choose from in their online store, and they even allow you to customize your order! Add or remove a skirt? No problem. Change up your cushion options? No sweat. We were really impressed by all of the different customization options that Carolina Chair has available, which is much easier for them to implement since they are not going through a retailer. Carolina Chair partners with Barrow Industries for their fabric options, which range from chenille, to denim, microfiber, suede, twill, and a ton more. Roger and Chris are based in Omaha, Nebraska and are producing great furniture, everything from sofas to beds and lamps. Their Blythe English sofa really stood out among the competition for its amazing comfort level and traditional English roll-arm style, which fits well into a variety of home styles. The seat cushions are soft yet supportive, made from a foam core wrapped in channel-stitched down. The back pillows also feel really nice and are made from a split between feather and down. You can even customize your Blythe sofa a little bit! Roger and Chris offer a few customization options like different lengths, seat depths, and leather colors you can choose from. Sizes range from 38″ all the way up to 121″. Each sectional unit is sold individually, so your whole couch can be customized as you like it, and it has the added benefit of being able to fit through pretty much any doorway or stairwell. The frame for each section is made from solid oak, so we found the support to be very sturdy (selling to customers straight from their factory and not going through a retailer allows them to invest more in the construction of their sofas). The sectionals are very easy to put together as well and don’t require any tools. The Modernica Split Rail Couch is handcrafted in California and an awesome, modern style to have in your home or office. Each of these couches are made to order based on your specifications, with 30 different fabric choices and a couple of options for your frame, either a North American walnut frame or a triple chrome-plated steel frame. We really like the sharp angles of the couch and the lack of armrests that help create the modern, minimalist look. The exposed frame is also unique, fully showing the legs and the back of the couch. Dimensions: H38″ x W88″ x D42″. The Sloane Sofa is made with incredible craftsmanship, and it shows in the price tag. It’s inspired by mid-century Danish styles with a sharp profile and tapered legs. The Sloane is a little more shallow than your typical sofas of similar size, which makes it easier to get in and out of, but less ideal if you really want to “sink” into your couch. This sofa has a very tight and supportive back too. These guys let you customize your sofa how you want it, with over 300 fabric and finish options. In addition to fabric and color, you can choose from a bunch of options for: leg finishes, cushion fill, base cover, contrast cushion, and contrast welt. 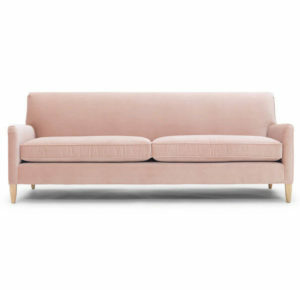 We also liked that the Sloane Sofa comes in a couple of different lengths, 74″ and 84″. Comfort is a non-negotiable when shopping for a couch. 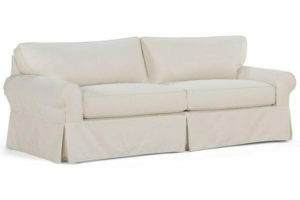 We looked for sofas that are made from the best materials and have good support with the inner springs in the cushions. Feel the springs inside the sofa – they should be tight and close together. In terms of filling, there are a couple of things to look out for. High-resilient (HR) foam is slightly more expensive, but worth it for the durability and comfort level. Polyurethane foam is cheap and typically less comfortable. Every person’s style is different. We made sure to choose a variety of sofa styles to cover a wide variety of interests. Many of our top picks have several hundred fabric and color options. A sofa is a lifetime investment, so you need to make sure that it can last reliably year after year. There are a few different factors to look for when it comes to durability: the frame, fabric, joinery, springs, and fillings. The frame is ideally made of a hardwood like oak or beech. Soft woods like pine can warp pretty easily over time. We looked for fabric options that are tough for everyday use. After all, you never know what is going to spill on it. Synthetic microfiber, leather, and fabrics with patterns woven in (rather than printed) are all winners. The joints of your couch should be solidly constructed. Avoid couches held together by nails and glue, and opt for ones that wooden dowels or corner blocks. As mentioned before, springs in the couch should be firm and close together. Fillings like high-resilient foam are good, polyurethane foam is bad. See more above. As a staple of your home, a sofa is a very personal purchase. So, the ability to customize is important. 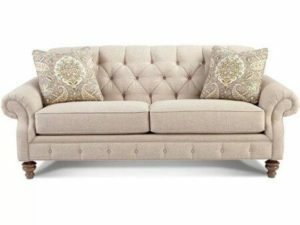 Often times, manufacturers have several options for each piece of the sofa on hand, and are willing to create a custom order (often times for a slightly higher price). We made sure to include some sofa manufacturers that have good custom options. Customer service is so important for such a big item like a sofa. We looked for manufacturers who are offering lifetime warranties, free delivery, setup services, a responsive customer service team, and more. We want to make sure you are getting the best sofa for your money. We eliminated several brands where we felt like the quality of the couch did not live up to the price on the tag. After all, we’re consumers too!